Hamilton Rugby Club hosted an Under 18 International for the first time on Sunday and credit is due to the club for enabling the game to go ahead, in conditions that were far from ideal, but on a pitch that held up well. Having lost to England last week at Darlington, Scotland Under 18 came back strongly and won convincingly with 3 tries from Neil Irvine-Hess and Lewis Carmichael (2) and 10 points from the boot of full back Gavin Lowe. Just as impressive was the stout defence that kept the Irish boys out for the full 80 minutes, even with a strong wind blowing down the pitch throughout the match. 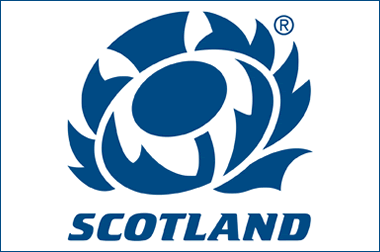 It was never going to be a day for expansive back play, and the Scots undoubtedly played the conditions better and deserve plaudits for that, but in many ways the performance seemed stereotypical of what we are watching at Scotland at all levels internationally at the moment. The back 5 of the pack, were strong, athletic and mobile, dominated the tackle contest, and ran effectively with the ball. Richard Taylor led a solid 3/4 defensive effort well, but in attack there was little seen, except the kick-chase that seems to have become the favourite weapon at every level this season. Mark Bennett was standing at the side of the pitch watching his old Cumnock mate Gavin Lowe, and one couldn’t help wondering if his ability to create space by drawing a man, and giving a pass, is almost entirely due to the 15 months he spent being coached in France, as it is to the main themes of the Scottish Development Age Grade process. Someone said in 6-Nations commentary over the weekend that the next big advance in Rugby Union will be attack based, as teams work out new ways to overcome the stifling defence of most international teams today. If we want to be at the head of that trend, we need to be investing in creating threequarters with excellent handling skills, as well as solid tacklers. On Sunday I was reflecting on watching an Under 18 international exactly 10 years ago. Of the side that played for Scotland that day only John Beattie and Greig Laidlaw were playing for Scotland on Saturday against Wales in the full international. Ben Cairns, John Barclay and Alan MacDonald have also come out of that team to play full international rugby. That’s 5 caps out of 26 in the squad, which compared with many years is a good harvest. That year group had some misfortune with injuries – Ian Kennedy, Wullie Brown and Ciaran Beattie hardly got their careers started before injury disrupted any chance of them playing at the highest level. Some of the team have had solid professional careers – James Eddie, Ian Nimmo (currently at the Dragons), Scott Newlands (Oyonnax in France) – while others have plugged away at club level, including Ben Addison, still performing well for Stirling County. But of the 30 players capped by Scotland born in 1985 or after, so far only 14 of them played for Scotland at Under 18 level. Some are anglo-Scots, not picked up by Scotland until a later age – e.g. Thom Evans and Tom Ryder; some have been project players of one guise or another – e.g. Dave Denton, Sean Maitland and Tim Visser; others weren’t good enough to gain caps at Under 18 level but have developed well in the Scottish club scene and gone on to higher honours, e.g. Lee Jones, Matt Scott, and Jon Welsh. It’s clear that it’s not a straightforward conveyor belt from Scotland U18 to Scotland International squad. That’s a good thing. For some of the boys this year will be the peak of their performance – they’re the best in their age group, and deserve congratulations for an outstanding achievement. It also means that some boys playing yesterday can rightly hold out the ambition of international rugby – Miller, Bradbury, Burnside and Carmichael could easily be tomorrow’s Barclay, Wilson, Harley, and Gilchrist; substitute No 9 Luke Earle-Wright, looked to have quick and consistent pass, wingers Angus Rennie and Rauridh Smith looked the kind of solid citizens needed for international wings in the post-Shane Williams era. But it also means that players of that age not selected for the international team still have the motivation to work away at their skills knowing that some of our top players have developed at a slower rate, physically or technically, but have still made it to the highest level of international rugby. By the way, what’s the secret of North Berwick’s recent production run of fine young schools players? And what’s the secret of the Beattie household – a son playing for Scotland at Murrayfield on the same afternoon their daughter plays football for Scotland in Cyprus? Must be some kind of recipe for sporting success to be learned from John & big Jill? Things seem to be looking up a bit at U20 and U18 level for Scotland which may be a sign of what the SRU have been working on over the last few years. However to build on this the number of professional players in Scotland has to expand otherwise any improvement at age grade will equate to no gain at senior level. Its a tough breakthough from age grade to senior level in any sport but in Scottish rugby getting a professional contract is virtually as competitive as it is to get into the Scotland saquad! 1. To increase the number of profesional players in the RBS Premiership, which could raise the standard and give Edinburgh and Glasgow more to choose from. But could enough players be supported to make a real difference? Bottom line the SRU need to try and build on any momentum that is building – Glasgow’s success, Murrayfield sell outs, and some wins across the board. Agreed. There is a major logjam of good young players building and they desperately need to give a greater number of young players more game time at a higher level. Hopefully, over the next couple of years Edinburgh will release the poor overseas signings they made at the end of last season and replace them predominatly with good young Scottish players and over time build a squad like Glasgow’s. This would ease the situation to a degree but more needs to be done. At the very least, I think the SRU should reinstate the District Championship, which could provide more of a stepping stone between the club and the pro game.